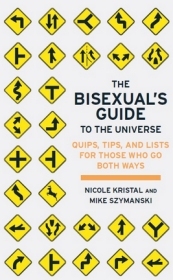 With a name that honestly isn’t riffing on a Douglas Adams novel, The Bisexual’s Guide To The Universe is a hugely popular collection of bi argument, experience and geekery. And now it’s been released as an e-book on the kindle. Which is a great help, as the print copies are getting harder to find. It’s not perfect – genderqueer readers may feel quite left out by the bouncy men-this women-that writing style, for example. It’s American and in places the gap between US and UK culture, especially US and UK bi culture, starts to show. They don’t realise Bob and Rose was a different show from Gimme Gimme Gimme. But it is just about the most fun bi book you can keep about the place.